U.S. Ambassador to the U.N. Susan Rice was honored Tuesday night with the 2013 Louis E. Martin Great American Award. The evening gala and awards ceremony, which included Vice President Joe Biden, came the day before State Department whistleblowers testified at the House Oversight and Government Reform Committee hearing on the terrorist attack that took place at the U.S. consulate in Benghazi last year. 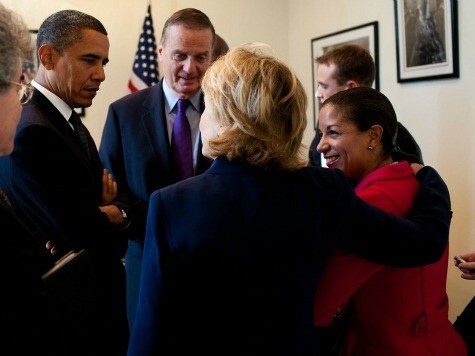 “What happened in Benghazi was in fact initially a spontaneous reaction to what had just transpired hours before in Cairo, almost a copycat of the demonstrations against our facility in Cairo, which were prompted, of course, by the video,” Rice erroneously stated on NBC’s Meet the Press–one of the five Sunday talk shows she appeared on five days after the attack. Gregory Hicks, the highest ranking American diplomat in Libya after the murder of Ambassador Chris Stevens and three other Americans last year, testified before Congress on Wednesday that he was “embarrassed” by Rice’s claims. Gowdy: Fast forward, Mr. Hicks, to the Sunday talk shows with Ambassador Susan Rice. She blamed this attack on a video. In fact, she did it five different times. What is your reaction to that? Hicks: I was stunned. My jaw dropped. And I was embarrassed. So what did Joey Choo Choo say about Susan Rice at the gala, one day before Hicks said he was stunned and embarrassed by her bogus anti-Islamic YouTube video story? Speaking of the president….where was he in all of this, anyway?